Today I get to celebrate the anniversary of one of my favorite attractions – The Twilight Zone Tower of Terror at Disney’s Hollywood Studios, which opened July 22, 1994. 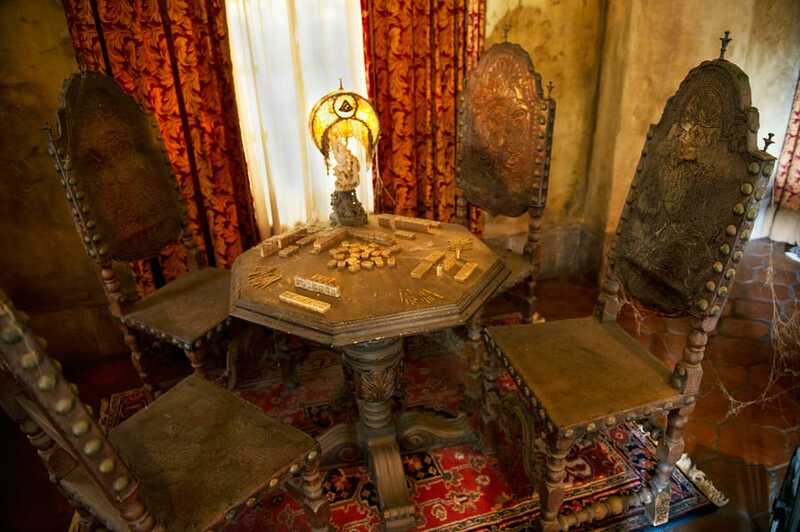 In honor of the attraction’s anniversary, Photographer Gene Duncan explored some of the details in the lobby of the Hollywood Tower Hotel up close – many of which were acquired by Walt Disney Imagineering at Hollywood auction houses. Here’s a look at what he found. Oh, the stories these chairs have to tell! 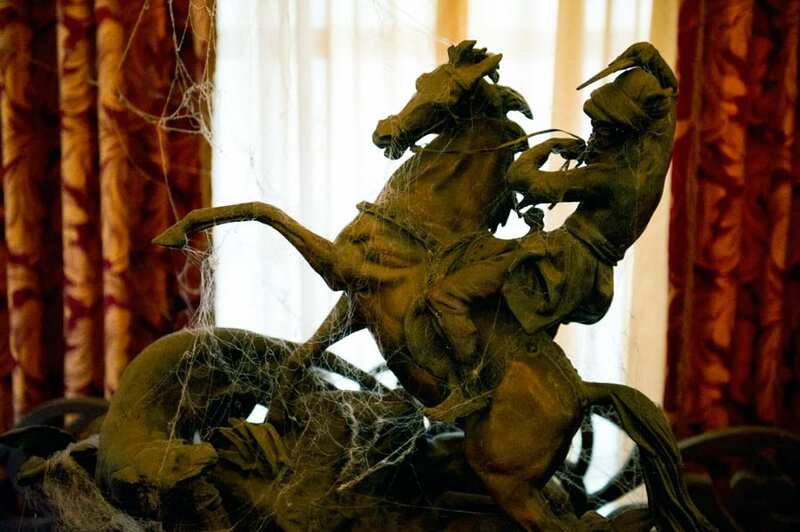 They’re actually authentic antiques that date back to the Renaissance. (Similar sets can be found at the Metropolitan Museum in New York and the Victoria and Albert Museum in London). 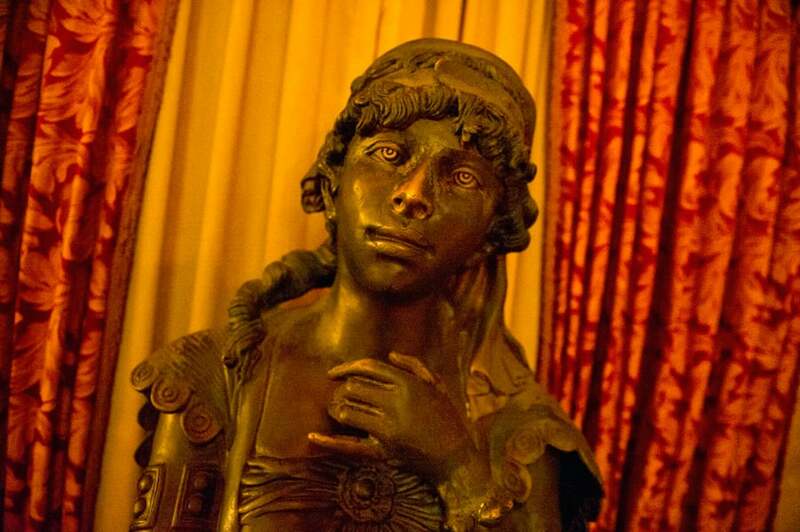 Several French bronze statues can be seen throughout the lobby, including a few fashioned by the famous 19th-century artist Moreau. His work ornamented many luxury hotels during the Golden Age of Hollywood. 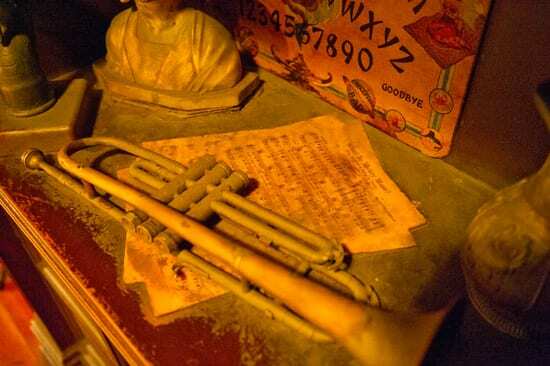 If you look closely, the sheet music under this trumpet is actually a copy of “What! No Mickey Mouse? (What Kind of Party Is This? ),” which was composed by Irving Caesar in 1932. Got goose bumps yet? Here are some additional shots. My daughters loved this ride, they rode it twice while we were there. Seriously one of my favorite rides at DCA. The little details of just the furniture and other items as you wait in line really make this ride truly memorable. I absolutely love this ride! Thanks so much for the background on some of the things in the lobby. I always try to explain Disney’s attention to detail to people who have never gone to Disney (poor souls! ), but words cannot do it justice! Only 45 more days and I’ll be able to ride TOT again! Can’t wait! Oh, and by the way, I’m a grandma who leads the way. As a Passholder, I spend LOTS of time in the Parks. I like looking at all the vintage items. People tend to ask what I’m looking for and now you’ve given me more info. to share. Now YOU can be the expert! We went to Disney world many,many,times.Every time we go we find something new that we haven’t noticed before.We love tower of terror.Love looking around the lobby.By the way we are 66 years youg and feel like kids when we are there. I’m fascinated but not surprised (knowing Disney) over all of authentic decorations and furniture that are a part of this attraction. Excellent job on the photography of all of these truly authentic and original pieces. My second favorite Disney attraction, just under Space Ship Earth. This is one of those rides that you can tell Disney went above and beyond in terms of theming and overall experience. From the misty outdoor queue to the authentic plants and entrance to the hotel, it’s all done superbly. Gene always does a great job with photography. I’m happy that our friends at WDI let us take these up-close shots. To our knowledge, no one has ever taken shots this close before. I’ve always been afraid to go on this ride, so this is a first look for me after 15 visits to WDW! You can always explore the queue and the lobby/library, then exit before the actual “ride” portion! Just adore the Tower of Terror but also loved Alien Encounter which was my first ever experience of real Disney magic, was really disappointed to find on my return to Disney in 2005 that this ride was not any more..will A.E. ever return? 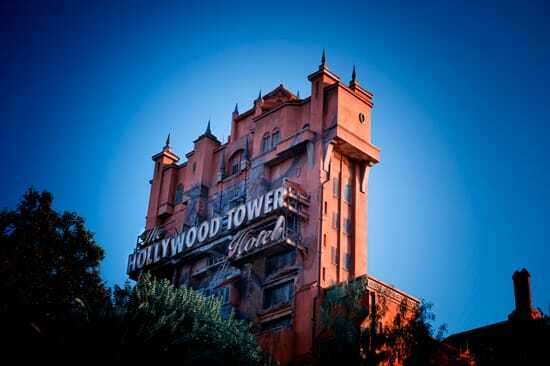 ?Love the changes to Tower of Terror though and can’t wait to ride it agian later this year!! I am so afraid to go on this ride and I am missing all this amazing imagineering!!! I think there’s a “drop out” opportunity right after the lobby and library rooms (before you get on the elevator). You should at least check it out! Thanks for this post Jenn. It might just be my favorite post on this blog to date. The Tower of Terror is my all time favorite attraction, and I think it’s a testament to the incredible work Imagineering does. Getting these up close shots and details of the lobby is like a Christmas (in July) present. I had no idea those chairs were actual antiques! I’ve always wanted to sit in one and look at all those mahjong tiles. Speaking of the trumpet, I would LOVE a follow-up post with pictures of more items littered around the queue, library, and boiler room that are references to Twilight Zone episodes. My personal favorite is the little devil-headed fortune machine on top of the library’s bookcase. Thanks so much, Michael. Gene had a lot of fun exploring the area looking for the list of valuable items to shoot – he said it was like a very exclusive scavenger hunt! I will never forget our last visit and my wife and my youngest daughter went on the Tower of Terror. They came off of it as white as the ghosts they saw on the ride! Too funny! When I was a teenager, I someone convinced my grandma to go on. When the ride was over and we were walking back down Sunset Blvd., she kept shaking her head and looking back over her shoulder. She couldn’t believe she did it! What a fun post! I ♥ your blog 🙂 This ride is so fun and unique in its own way. The detail is incredible. Thanks for some of the insider info! We were there in ’94 the day after it opened! Long lines but worth the wait…even if there was only one drop at the time!!! Love the newer version…multiple random drops!!! Pure Disney magic!!! Yep, the current ride sequence is a lot of fun. You never know what kind of ride you’re going to get. LOVE, LOVE, LOVE THIS RIDE. IT’S MY ALL TIME FAVORITE! THANK YOU FOR THE PICTURES. I TRY AND LOOK CLOSELY EVERY TIME I GO ON TO SEE IF I’VE MISSED ANYTHING. The first (and last) time I rode this, I was too nervous to look around! I might have to give it another ride. What sets Disney apart from everywhere else is the storytelling. 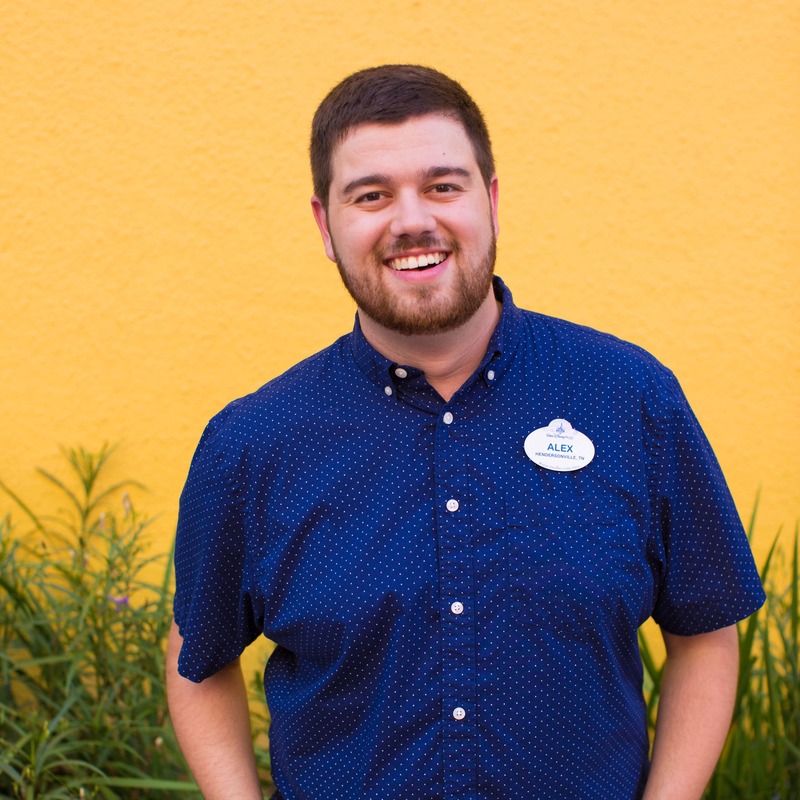 I’m going to try my hardest to get a Disney internship next year (I’m a marketing major with a minor in graphic design.). Every time I’ve visited, I’m always treated like a princess, even if I’m among tens of thousands of other guests. I want to create memories for others too. Hooray for Disney! Thanks for your cheerfulness – it brightened my afternoon! I absolutely love this attraction. The best place to sit is right in the middle! That is where I sat the first time on it and it was awesome! Any comments on the lamps? Are they Tiffany? Not sure. If so, they’re in immaculate condition! My wife and I are always making the same comments on how Disney goes the extra mile to make things look real and authentic. One of our favorite rides is Expedition Everest, and from the back packs to the masks, it looks like something you would find in a village at the base of Everest. That is why we keep going back, the attention to details. Plus we love Disney! I was lucky enough to be there on opening day of this attraction. The 3 hour wait in the heat and crowds were the best 3 hours I’ve ever spent in my life. Nothing like it! Still my favorite. I wish you would have included the history of the Errol Flynn chair. 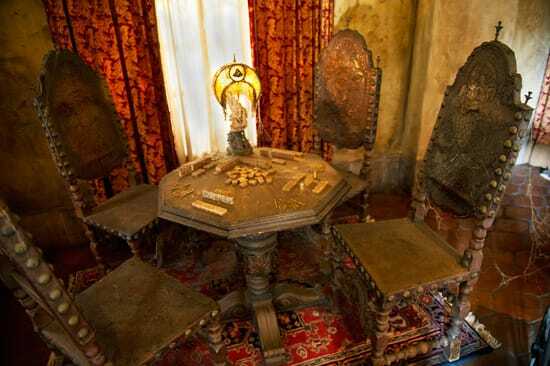 That is my favorite hidden thing in Tower of Terror. 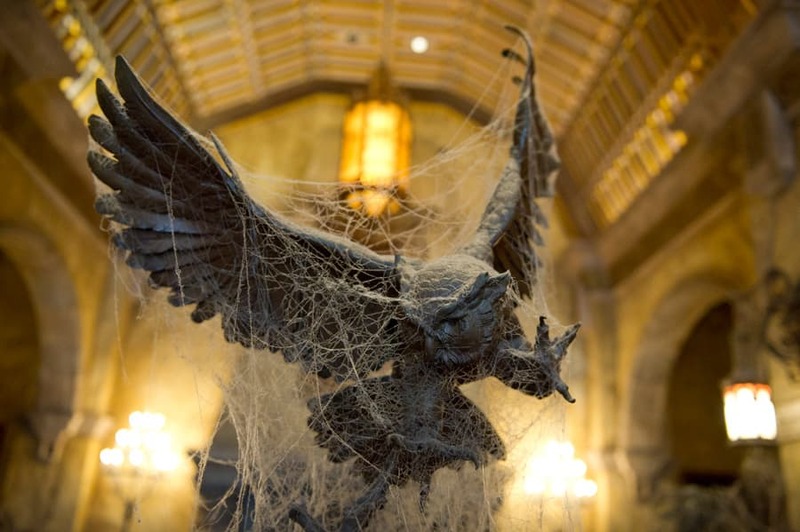 That owl sculpture at the front of the lobby has always creeped me out. The way its head is turned down and the cast of the light in the lobby always makes me think it is a sculpture of a headless bird of prey. this is the second favorite attraction at hollywood studios, first is of course toy story mania, (I am a huge toy story fan), cant get enough of this ride when I am down there. I go back and forth between Tower and Haunted Mansion as my favorite. Toy Story Mania! is a lot of fun, too. Although my husband ALWAYS gets a higher score than I do. I love all the little tributes to The Twilight Zone shows in the library. Those would be some interesting photos to share. 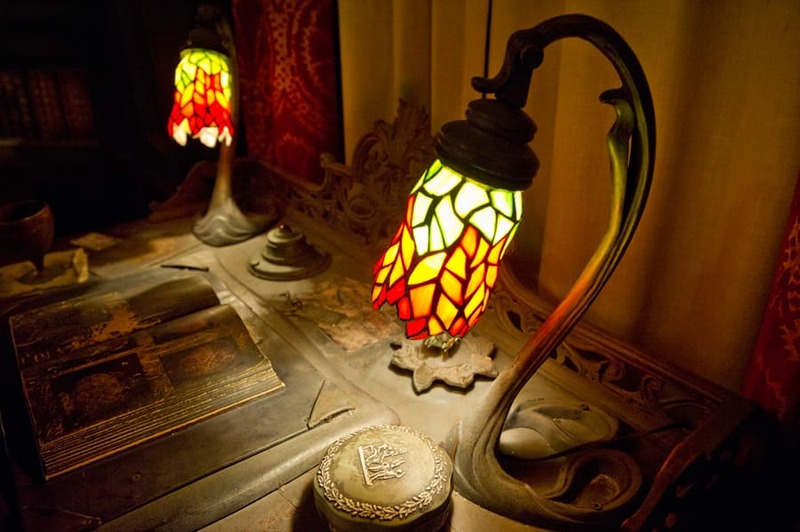 The attention to detail for this attraction is absolutely stunning. I find myself more attracted to every little detail that is part of each attraction. I am always amazed. Me, too. I can’t believe they have chairs from the Renaissance! Yes…this article definitely needs more!!! More pictures, more trivia, more, more, more!!! This is my favorite ride on both coasts. Love the atmosphere, and the area music is fantastic! We definitely dedicate a good amount of time to repeat rides on each trip. In fact, a week ago I got a Hollywood Tower Hotel key tattoo! 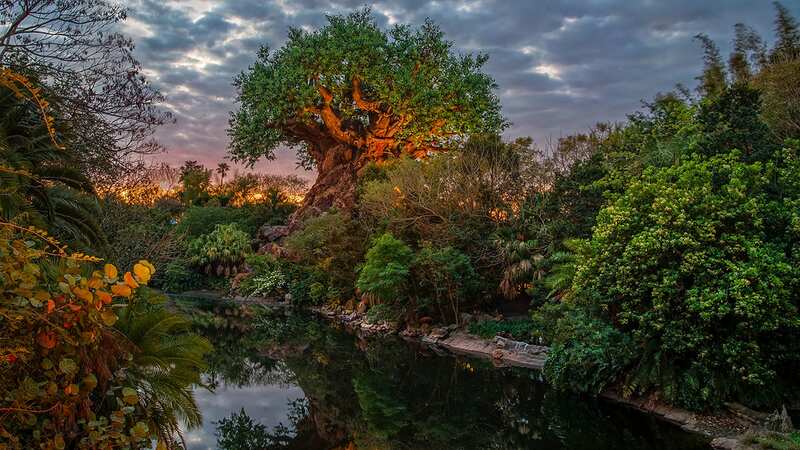 This is my favorite ride at any of the parks, and the changes they made in the last few years were so much better than when i was first there 7 years ago. It was so cool this last time we went where my 14 year old daughter and I were almost the only ones in the car, one other couple was with us. In the library there are a ton of nods to the old Twilight zone shows; and the “B” on the door when it opens becomes a 13…really awesome ambiance, and awesome ride. great at night to see over the whole park and all the lights as the doors open. Thanks for more details and reminding me why we need to get back down there. This is always the first ride I go on when visiting the park. I always take an extra second to read the hidden “Evil Tower U R Doomed” message on the Lobby board to see if it is still there or has been changed. I remember riding it the 2nd day it was open. Always a cool ride. I’ve always loved to look at the lobby while i’m waiting in line. 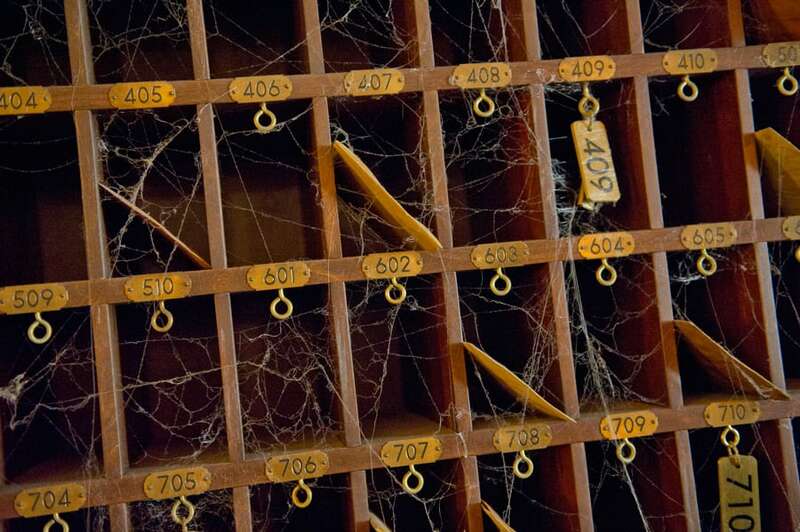 Every time I do I think that Disney should recreate the hotel on property it would be so cool…of course with out the spider webs and dust! I agree. Tower and Haunted Mansion are two of my favorites! More pictures and details please! I have always wanted to explore the lobby in person, so this is as close as it gets. I plan to see all of these in person tomorrow!! 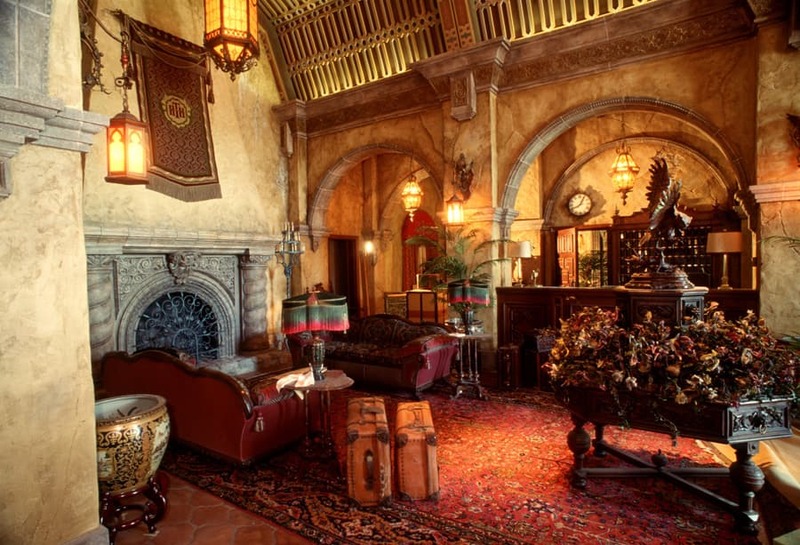 Thanks for the history lesson, I had no idea that the lobby was actually full of antiques, I thought it was just more imagineering magic! With this info, you could be the family tour guide! Very interesting pics. Definitely one of my favorite attactions. I love seeing the “behind the scenes” stuff. This is my favorite attraction at Holloywood studios, with a close second being the Toy Story Mania. I like it when the lines are moving a little slow so that I get a chance to look at all of the wonderful things in the lobby. Happy we could give you this up-close look! That’s why Disney is so special… No one pays attention to the lil’ details like Disney!